The most commonly cited estimate of annual deaths from medical error in the US—a 1999 Institute of Medicine (IOM) report7—is limited and outdated. The report describes an incidence of 44 000-98 000 deaths annually.7 This conclusion was not based on primary research conducted by the institute but on the 1984 Harvard Medical Practice Study and the 1992 Utah and Colorado Study.8 9 But as early as 1993, Leape, a chief investigator in the 1984 Harvard study, published an article arguing that the study’s estimate was too low, contending that 78% rather than 51% of the 180 000 iatrogenic deaths were preventable (some argue that all iatrogenic deaths are preventable).10 This higher incidence (about 140 400 deaths due to error) has been supported by subsequent studies which suggest that the 1999 IOM report underestimates the magnitude of the problem. A 2004 report of inpatient deaths associated with the Agency for Healthcare Quality and Research Patient Safety Indicators in the Medicare population estimated that 575 000 deaths were caused by medical error between 2000 and 2002, which is about 195 000 deaths a year (table 1⇓).11 Similarly, the US Department of Health and Human Services Office of the Inspector General examining the health records of hospital inpatients in 2008, reported 180 000 deaths due to medical error a year among Medicare beneficiaries alone.12 Using similar methods, Classen et al described a rate of 1.13%.13 If this rate is applied to all registered US hospital admissions in 201315 it translates to over 400 000 deaths a year, more than four times the IOM estimate. Similarly, Landrigan et al reported that 0.6% of hospital admissions in a group of North Carolina hospitals over six years (2002-07) resulted in lethal adverse events and conservatively estimated that 63% were due to medical errors.14 Extrapolated nationally, this would translate into 134 581 inpatient deaths a year from poor inpatient care. Of note, none of the studies captured deaths outside inpatient care—those resulting from errors in care at home or in nursing homes and in outpatient care such as ambulatory surgery centers. Human error is inevitable. Although we cannot eliminate human error, we can better measure the problem to design safer systems mitigating its frequency, visibility, and consequences. Strategies to reduce death from medical care should include three steps: making errors more visible when they occur so their effects can be intercepted; having remedies at hand to rescue patients 17; and making errors less frequent by following principles that take human limitations into account (fig 2⇓). This multitier approach necessitates guidance from reliable data. 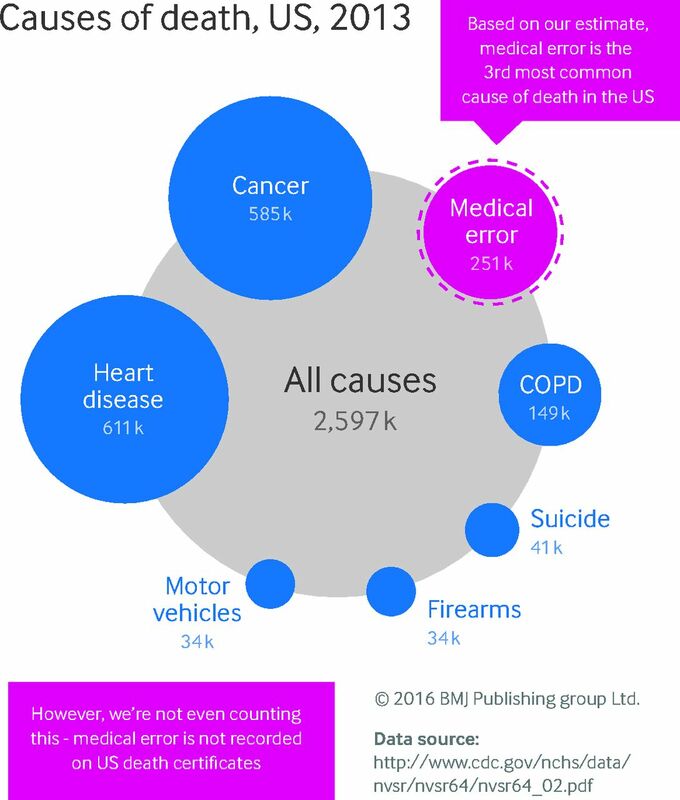 Currently, deaths caused by errors are unmeasured and discussions about prevention occur in limited and confidential forums, such as a hospital’s internal root cause analysis committee or a department’s morbidity and mortality conference. These forums review only a fraction of detected adverse events and the lessons learnt are not disseminated beyond the institution or department. Contributors and sources: MM is the developer of the operating room checklist, the precursor to the WHO surgery checklist. He is a surgical oncologist at Johns Hopkins and author of Unaccountable, a book about transparency in healthcare. MD is the Rodda patient safety research fellow at Johns Hopkins and is focused on health services research. This article arose from discussions about the paucity of funding available to support quality and safety research relative to other causes of death. Moriyama IM, Loy RM, Robb-Smith AHT, et al. History of the statistical classification of diseases and causes of death.National Center for Health Statistics, 2011. Deaths: final data for 2013. National vital statistics report. http://www.cdc.gov/nchs/fastats/leading-causes-of-death.htm. Leape LL. Error in medicine. JAMA1994;272:1851-7. doi:10.1001/jama.1994.03520230061039 pmid:7503827. Reason J. Human error.Cambridge University Press, 1990. doi:10.1017/CBO9781139062367. Reason JT. Understanding adverse events: the human factor. In: Vincent C, ed. Clinical risk management: enhancing patient safety.BMJ, 2001:9-30. Grober ED, Bohnen JM. Defining medical error. Can J Surg2005;48:39-44.pmid:15757035. Kohn LT, Corrigan JM, Donaldson MS. To err is human: building a safer health system.National Academies Press, 1999. Brennan TA, Leape LL, Laird NM, et al. Incidence of adverse events and negligence in hospitalized patients. Results of the Harvard Medical Practice Study I. N Engl J Med1991;324:370-6. doi:10.1056/NEJM199102073240604 pmid:1987460. Thomas EJ, Studdert DM, Newhouse JP, et al. Costs of medical injuries in Utah and Colorado. Inquiry1999;36:255-64.pmid:10570659. Leape LL, Lawthers AG, Brennan TA, Johnson WG. Preventing medical injury. Qual Rev Bull1993;19:144-9.pmid:8332330. HealthGrades quality study: patient safety in American hospitals. 2004. http://www.providersedge.com/ehdocs/ehr_articles/Patient_Safety_in_American_Hospitals-2004.pdf. Classen D, Resar R, Griffin F, et al. Global “trigger tool” shows that adverse events in hospitals may be ten times greater than previously measured. Health Aff2011;30:581-9doi:10.1377/hlthaff.2011.0190. Landrigan CP, Parry GJ, Bones CB, Hackbarth AD, Goldmann DA, Sharek PJ. Temporal trends in rates of patient harm resulting from medical care. N Engl J Med2010;363:2124-34. doi:10.1056/NEJMsa1004404 pmid:21105794. American Hospital Association. Fast facts on US hospitals. 2015.http://www.aha.org/research/rc/stat-studies/fast-facts.shtml. James JTA. A new, evidence-based estimate of patient harms associated with hospital care. J Patient Saf2013;9:122-8. doi:10.1097/PTS.0b013e3182948a69 pmid:23860193. Ghaferi AA, Birkmeyer JD, Dimick JB. Complications, failure to rescue, and mortality with major inpatient surgery in Medicare patients. Ann Surg2009;250:1029-34. doi:10.1097/SLA.0b013e3181bef697 pmid:19953723. Provenzano A, Rohan S, Trevejo E, Burdick E, Lipsitz S, Kachalia A. Evaluating inpatient mortality: a new electronic review process that gathers information from front-line providers. BMJ Qual Saf2015;24:31-7. doi:10.1136/bmjqs-2014-003120 pmid:25332203. Institute of Medicine of the National Academies. Continuous improvement and innovation in health and health care. Round table on value and science-driven health care.National Academies Press, 2011. Office for National Statistics’ Death Certification Advisory Group. Guidance for doctors completing medical certificates of cause of death in England and Wales. 2010. Statistics Canada. Canadian vital statistics, death database and population estimates. http://www.statcan.gc.ca/tables-tableaux/sum-som/l01/cst01/hlth36a-eng.htm. World Health Organization. International classification of diseases.http://www.who.int/classifications/icd/en/.